What a weekend… No swine flu here though. The winds of change were blowing in Denver. Friday night saw the Rockies lose a battle against the Dodgers 6-5. It was a close game for the most part and I take the loss. My curse on the Dodgers really hasn’t materialized the way I hoped. I may need to take the grass from Dodger stadium to a good voodoo specialist. Friday night also saw the debut of the Rocky Mountain Way-I Live for This tag team debut. 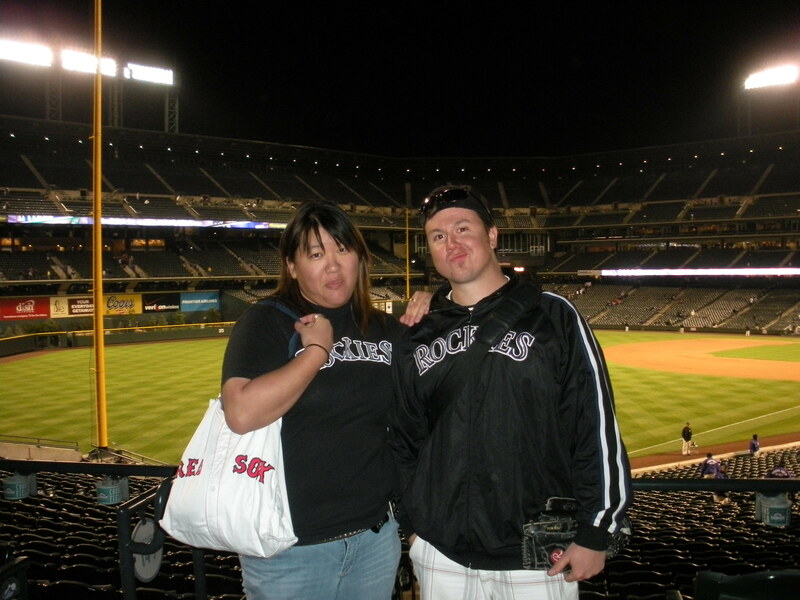 Emily and I would try and combine our forces to rally the Rockies, but we came up short. I wanted to blame it on the Korean, but Emily and I would agree that I would take the loss. With Emily and her two girlfriends in attendance, it was no surprise to me the talk of baseball butts would come into play. Trying to be the team player, I took care of the “photos” for the ladies. Needless to say, guys can skip to the next section of the blog, but the ladies I’m sure will keep with the longer glance. Don’t ask me, I just take the photos. Emily was nice enough to provide me with my first free ticket of the year. Other than the score of the game, it was a great time. “I Live for This” is a pretty accurate description for Emily, her blog and her love of baseball. She’s more than willing to give you any baseball answer and if she doesn’t know it, she may let you know she likes to make stuff up! Emily and I ran into Don of Rockpile Rant and he was in the intense “zone” trying to hawk some balls during batting practice. He caught one of the last balls of the practice and gave it to Emily. Our ace, Aaron Cook, did not live up to my prediction of going 7 2/3 scoreless innings, but he didn’t have the worse outing of the year, so maybe things are changing for the better. After getting touched up in the first, he settled in and had some good innings. I hope he’s past the bad outings. The Rockies would fall again Saturday to the Dodgers 6-5. Ubaldo Jimenez, who is a huge hope of mine, was sketchy at best and never really found command of his fastball. and would end raining. The Rockies rained down runs on the Dodgers and scored 10 runs. It was nice to see and I wasn’t really complaining at all! I had a different outfit on and I will continue to wear it trying to figure out if it may be the lucky one this season. Sunday also had a very bright spot during the rainy, cloudy day and I will talk all about it in tomorrow’s blog. In this lifetime we will create many different “families.” Some you may create at church and some at work. People you met in school and grew up with may become “aunts” or “uncles” to your children. Sometimes we create families to enrich our lives and sometimes we find we are part of a bigger family who we rarely ever know. This particular type of family is the one I highlight in today’s Timeout because this particular gal just recently graduated from my alma-mater and became part of an alumni I am proud to be part of- the University of Northern Colorado. graduated. We are the Bears and I can still hear the fight cheer as the drums banged ,duh duh, duh duh duh duh- U-N-C Beaaars and I’m always happy to meet other alums and hear their story. There are many of us and some like my old suite mate, Aaron Smith, make millions and have won a Superbowl and some of us are like 23 year-old Emily of I live for This, who are budding professionals looking for that break into their chosen profession. I was happy to learn Emily would be joining the family and I found myself admiring her writing as open and candid on her blog. She obviously loves the Rockies and had no problem letting her writing speak for itself in that regard. Emily is also okay with explaining her journey in graduating and trying to find a job in the elusive sports psychology field. Just to help another Bear, I will also make the plea. If anyone knows a sports team looking for a sports psychologist Emily is eager and available to take on the task even starting from the ground up! Read all about it in her post and help this Bear get her start if you can! Emily I’m sure we can work out a nominal finders fee if you get a job! Wink. 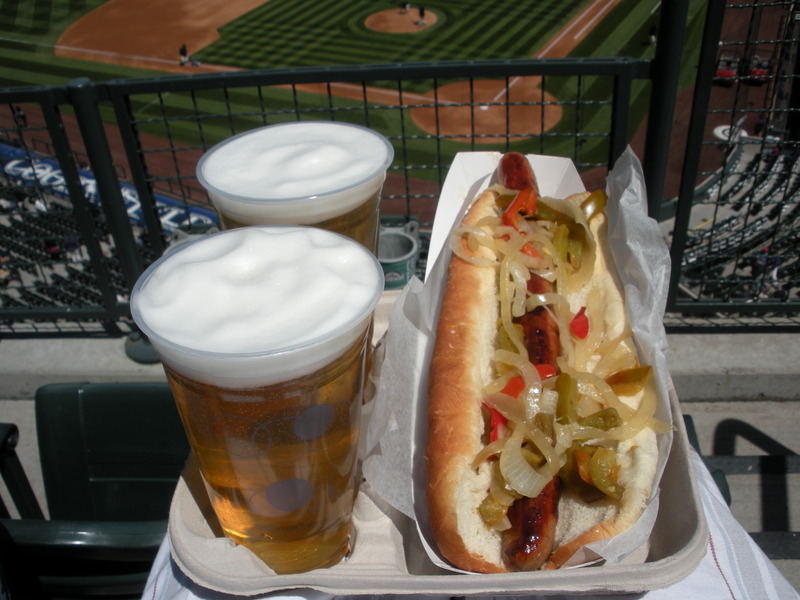 Your header “I live for this” makes a bold statement and you compare yourself to “fever pitch” just for the Rockies. How much of role does baseball really play in your life? 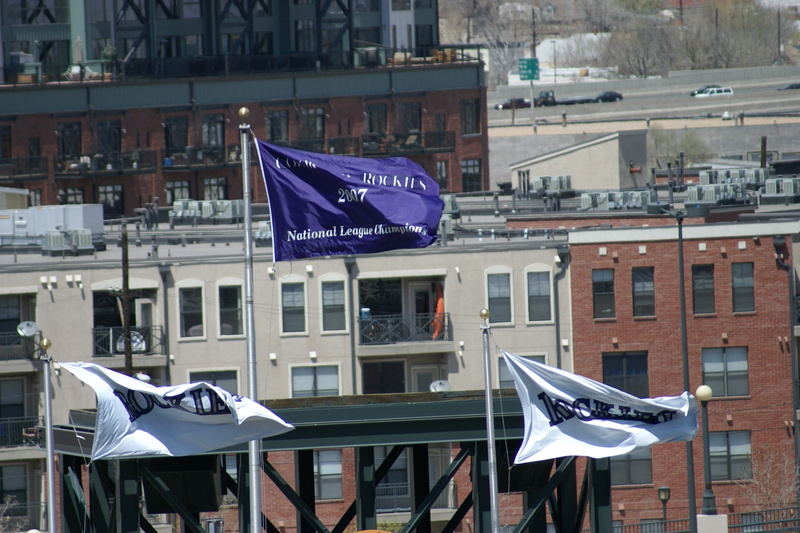 There’s no dispute that I live for this as a header is a bold statement, and while I definitely wouldn’t say I’m as obsessed with the Rockies as the guy from Fever Pitch, I can’t help but be absolutely amazed by baseball. Not a day goes by where I don’t think about it. Toward the end of the last season, when Dan O’dowd was talking about getting rid of Matt Holliday, which he did, and Garrett Atkins, my friend and I tried to draw up this plan about how not to get rid of either of them. We talked about the trading potential of each player, and ultimately decided that Yorvit Torrealba, Jeff Baker, and Willy Taveras, those semi big names, could go, plus some of our pitchers. We obviously know how it turned out, but… well, ya know. But in all honesty, my friends make fun of me that I have a baseball blog, they think that I am in serious need of an intervention, and that I should probably get something in my wardrobe besides Rockies t-shirts. Baseball’s become a pretty important part of my life; besides the obvious ones like family, friends, the ability to think, et cetera, it’s up there in my top… four… five? No… let’s go with four. In your blogs you have been pretty open about the idea of becoming a sports psychologist and your struggles finding a job opening since graduation. Is it your destiny to get into the minds of the pros or would you consider another career if you can’t be a shrink in baseball? Sports psychology isn’t so much about being a shrink with baseball. However, besides something like golf, baseball is probably the sport that takes the most mental concentration and preparation. If you were to go into a sport like football, a sports psychologist would probably really only play a role with the quarterback, receivers, and the kicker. With something like soccer and hockey, it’s the goalie that you want to study with, and basketball… um… I’m not really sure; you’d probably have to work with players on free throws…? I guess. What exactly is a sports psychologist? Having just graduated from college what advice would you give an incoming freshman on life following the big day and getting to where you need to be upon graduation day? Um… good question… I guess… hmm… I guess keep an open mind because you’re never going to know what you’re absolutely going to fall in love with. My grandpa always told me if you love what you do, you’ll never work a day in your life. I entered college as a journalism and mass communication major, and in one semester switched it to psychology, to social sciences, to secondary education with an emphasis in social sciences, back to journalism, to sociology, and then back to psychology. Don’t be afraid to branch out and experience something you’re not sure about. Like, throughout my entire college career, there was so much more I wanted to do. I was definitely pissed I didn’t discover my love for baseball until it was a little too late, but between that time, I wanted to be a shark biologist. Kind of… ya know… a 180 from where I was to where I am now. You say your next team next to root for is the Red Sox. After the disater that was the 2007 World Series what would Freud say about this possible conflict and would it involve a parent(s) in some sick way? Being considered a psychology professional now with your degree, in your professional opinion what is the toughest position mentally to play in baseball and why? Every position is tough to play. 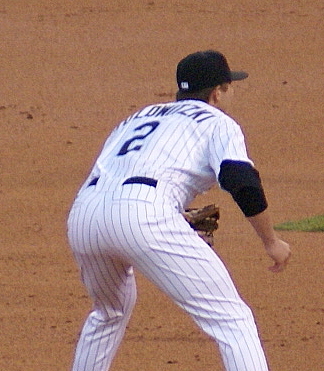 Outfielders have to decipher where the ball is, where to throw, which way to run. But I’d say infield is a little tougher, with things like bad hops, runners, among other things. 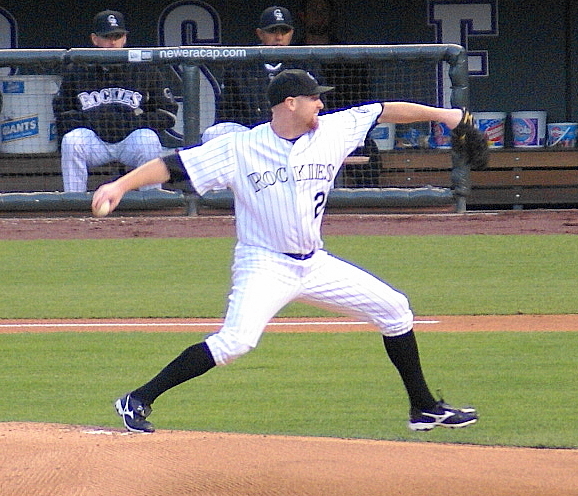 Pitcher’s have to go straight into playing defense, throwing a ball can be tough, which is where a sports psychologist would come in; third deals with knowing your reflexes, positioning yourself right; short stop gets the smallest margin of error, receiving the most balls; second often has to throw off balance throws; first is also about positioning yourself, reading your pitcher. But, I’d definitely say the toughest position mentally to play is the catcher. And I’d definitely say that’s because I, personally, expect a lot out of the catcher. 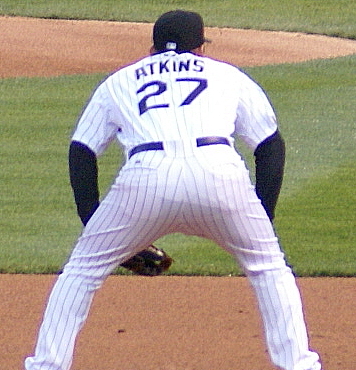 The catcher is the one who has to call the correct pitch, which means that he has to know the batter and know his tendencies. Does he swing at things inside? Outside? High? Low? The catcher also has to be mentally prepared for any wild pitch coming at him and be able to stop it, which means he always has to be alert. He has to be able to react fast enough when someone is trying to steal second and make a sound throw. He also has to know where the ball is, know where the runner is, and know where the bag is when someone’s coming in to score. Yeah, I’d definitely say the catcher demands the most. Plus, all the physical stuff, getting hit with balls, crouching up and down over and over again, his position is so demanding both mentally and physically. So… yeah. Finishing it up, how would you describe your perfect year in 2009 in regards to friends, family, work and baseball? then I envisioned if I was a clog dancer… yeah. But really, the people out there are so supportive and respectful of your opinions. I’m really, really lucky that I chose to become apart of something as awesome as mlblogs. It’s been one of the greatest things of my life. Oh, and the other thing, would definitely be to make it into the top 100 blogs. I’m a really shy person, you probably can’t tell by this, but I get all hesitant when I want to comment on other people’s blogs like, “oh man, what if they’re like ‘oh, stupid ignorant girl'” or something. Anyway, so I’ve started trying to comment on more blogs and get mine out there too. So… maybe not be so shy is a good one either. I should probably make some new years goals while I’m thinking about it… But for the most part, yeah, I guess that’s it. It’s a wrap and # 4 fun and done. Thanks Emily for taking the time and being a great sport and look for another Timeout soon as we get to #5 and all things blogged!